In this installment of pumps and motors, we will discuss how pump head is created, why it is neither good or bad, and why the head on your beer isn't comparable. 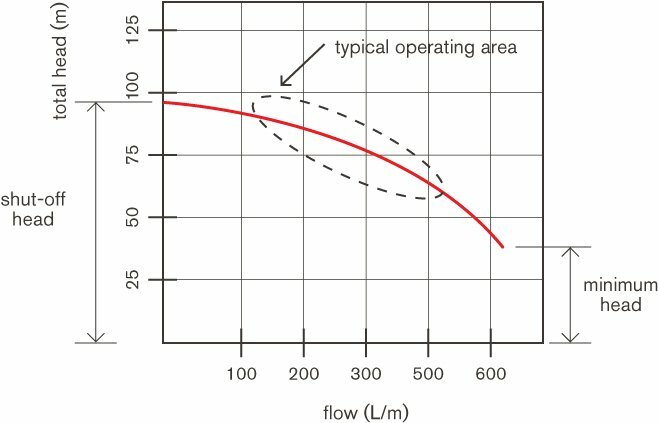 When you select a pump there are two basic parameters: Flow and Head. Flow is expressed in gallons per minute and is easily understood. Head is expressed in feet of water column, and is largely misunderstood. If we want to move water, for example, in the simplest of terms, that is doing work - we are causing displacement - a "transfer of energy" if you will. We want to move these gallons over there. To fully define the work, we need to know what obstacles there are to overcome in order to get the water from here to there. How far is it? Is it uphill? Is it a long windy road? We have just described "head" as it applies to pumping. Imagine if the water leaves the pump discharge and shoots straight up for 100 feet. That is, a column of water 100 feet into the air. We have just accomplished 100 feet of water column, or 100 feet of head. The obstacle is gravity. A pump having a higher head rating can create a higher water column. A higher head AND flow rating means more water, higher. All centifugal pump performances can be plotted on a curve with the vertical axis, head, and the horizontal axis, flow. In a closed loop system, we aren't pumping against gravity. The system might deliver water from the ground floor to the 4th floor, but it will come back down to the pump suction. The two vertical columns of water will cancel each other out. The component of head will be the friction loss of the pipes. It is hard work to push water through a pipe. The longer the piping, the smaller diameter of the pipe, the viscosity of the fluid, and the more flow (GPM) we need, all have an impact on the amount of work (head). Head through a pipe is a fixed quantity and the longest loop of our hydronic system tells us the maximum amount of head we calculate for. The next time you are contemplating the head of a beer while waiting for your friend to show, and you find yourself contemplating pump head, reach out to us with any questions! Remember, too much head can delay your enjoyment of the beer and too much pump head can be overcome with a larger pump!